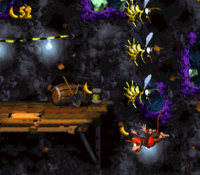 Windy Well is the 29th level of Donkey Kong Country 2: Diddy's Kong Quest (or the 31st in the Game Boy Advance port). It is also the second level of K. Rool's Keep, or the fourth in the Game Boy Advance port where it switched positions with Castle Crush. Windy Well takes place in the final mine shaft level. The main feature is the strong gusts of wind, which pull Diddy and Dixie Kong farther up into the level. They are required to use the wind to go up higher into the level. The wind stops blowing when the Kongs go onto a platform or, in some cases, when they hit a certain point in the air. 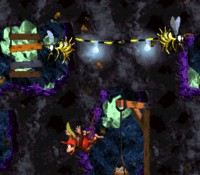 The main and most common enemies are yellow Zingers, who appear throughout the level. The Kongs must carefully maneuver themselves in the air to avoid any obstacles. Sometimes they need to horizontally navigate themselves through Zingers as the wind blows them up. Even though the wind is an essential feature, it can be a disadvantage, because if it blows the Kongs onto a platform, they cannot backtrack to obtain any collectibles or Bonus Barrels that they may have missed. The player can influence the speed at which the Kongs rise or fall with the directional pad, where pressing "Up" will increase the speed of their ascent, and pressing "Down" will decrease the speed of their ascent. Typically, slowing down the speed can be good for acquiring items such as K-O-N-G Letters in midair, while increasing speed can help evade encircling Zingers, or the hook thrown by a Krook. Some brief walking portions occur on the wooden platforms, which Kutlasses and Krooks most often appear on. Diddy and Dixie floating through the level, below two Zingers. When they start the level, the heroes must cross a few gaps and try not to fall off the small platforms between them, as the Click-Clacks on them can be quite an obstacles. Soon, they monkeys must jump up and be lifted upwards by the strong winds. When they get on the platform above, the heroes must ascend again and sneak between some Zingers to get to another platform. Here, they will have to dodge a Kutlass and cross a gap. They will then get to a hook, which must be hopped off of for the wind to pick them up again. 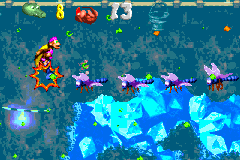 The Kongs must travel around many Zingers as they come up to the next platform, where they must then jump between several Zingers without being pulled into them by the winds. The group must make their way east, and jump off of a hook to journey even higher. When they avoid all the Zingers and get to the next platform, they will need to jump up again and travel higher. This time, they will meet only a few Zingers, although they will encounter a Krook, too, and he can be a big hazard if they aren't careful. Diddy floating up to three Zingers shortly before the Star Barrel. At the platform above this foe, the Kongs must ascend to a barrel and shoot up to a few more platforms. The monkeys' time on solid ground won't last long through, because they will have to jump yet again and wind travel to another platform. They will have to go west from here, however, there is a large wall of three Zingers blocking their path. So, they should carefully float under these foes with the wind, and get to the next platform. Jumping here will cause the wind to pick them up again, and drag them to an area cluttered with all kinds of Zingers. 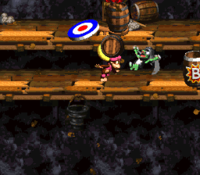 Once these foes are all passed, the monkeys will land on a platform with the Star Barrel on it. Halfway through the level, the Kongs must climb up a few more platforms and watch out for a couple of Krooks. Soon, they will have to journey east, although there are several Zingers in the way. They must jump between the foes as they move back and fourth. This would normally be easily, however, the wind will pull the heroes up to the top Zinger, so it can be tricky. Once passed this area, the heroes must jump up again to get to glide up to another platform. Several prizes float above them at this point, but they shouldn't get them, and instead travel west, where they will have to cling onto some hooks, then jump off. The wind will pick them up and take them to a higher floor. When they travel upwards, though, they must be careful, as there are Krooks hanging around on the sides. The heroes must try to avoid the hooks thrown at them, and shortly after get to the platform above. Here, they should follow the banana trail to another platform, and then jump at this point to be lifted up by the wind again. As the Kongs ascend, they will encounter many Zingers flying all around. They need to use their skills to get away from the wasps, and then land on a small platform. Right after landing on it, though, they should hop again and by pulled higher. They will have to make their way to the platform in the far corner of the area then, and hop west. The wind will pick them up, by not pull them too high. Instead, it will keep them at a certain level, as the heroes slide under the nearby group of Zingers. After passing these foes, they must make a turn in direction, and ascend north. As they go, they will need to watch out for several Zingers and finally make it back up to land. But, they have to jump again here, and travel higher into the mine shaft. Four Krooks will be throwing their weapons at the Kongs as they float upwards, followed by a swarm of Zingers that must be avoided at all cost. Finally, though, Diddy Kong and Dixie Kong will make it to the highest platform, where they must walk east and cross a small gap. 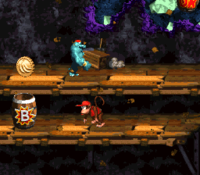 The End of Level Target is nearby, with prizes including a Banana Coin, Banana Bunch, or the letter G.
The locations for the first and second Bonus Barrels each. After collecting the letter O, the Kongs must pass a Krook and go left to reach a pair of two platforms, the bottom one having the Bonus Barrel. They must slowly float themselves to the end and into the Bonus Barrel. In this Bonus Area, Diddy and Dixie must defeat nine Flitters within 20 seconds. At the start, they can jump to float up to a hook and then bounce off several Flitters to fall back down to the other side of the ground with the Kremkoin. 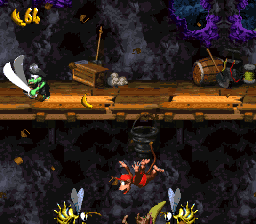 At the very end, the Kongs can find a Kutlass and a Klobber below the End of Level Target. The lead Kong must pick up the Klobber and ram it into Kutlass to safely cross into the Bonus Barrel. The Bonus Area takes places in an enclosed bramble area. Squawks is floating directly above the start point. 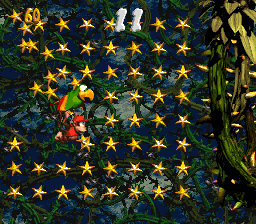 The Kongs must ride Squawks and go up to collect all 80 stars with 15 seconds. They must be careful to not hit the brambles, as this causes them to lose at the challenge. After collecting every star, the Kremkoin appears on a platform at the right. DK Coin After the letter N, the Kongs must pass two Krooks to and float up onto a platform. There are three Bananas above them, which they would normally follow up to the next platform. Instead of following the Bananas, the Kongs must jump all the way right for the wind to carry them past three Zingers and to the DK Coin at the far end. If the Kongs float up onto the above platform without obtaining the DK Coin, they cannot return to collect it. 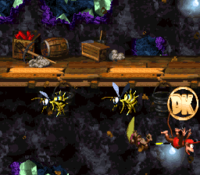 Golden Feather (GBA version) At the start of the level, the Kongs must go onto the platform with the first DK Barrel floating above. Instead of jumping to the DK Barrel, the Kongs must cartwheel underneath the floorboard and grab the Golden Feather. After doing so, they are blasted back onto the main level. At the very start, the Kongs must jump into the first gap. The letter K is located here, and an Arrow Barrel blasts the Kongs back onto the main stage. After floating past two groups of Zingers, the Kongs can find a Click-Clack on a platform. By jumping up, the wind carries the Kongs up to two Zingers, of which the O is floating between. After the Star Barrel, the Kongs must pass two Krooks and some Zingers. After this, they must jump onto another platform and allow the wind to carry them up to another platform with an Extra Life Balloon and the letter N between a pair of three Zingers. Diddy and Dixie floating to the End of Level Target. This page was last edited on April 10, 2019, at 10:56.